We recently were invited to attend the Sensoria Food and Wine Festival. 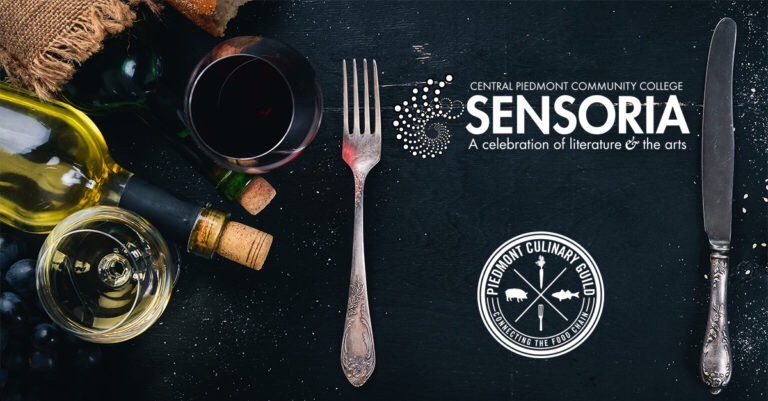 This festival was a one day event to conclude “Sensoria: A Celebration of Literature and the Arts” at Central Piedmont Community College in Charlotte. The food and wine festival was presented by the Piedmont Culinary Guild with sponsorships from the North Carolina Department of Agriculture’s #GotToBeNC Program and Springer Mountain Farms. The day featured classes ranging from Riedel glass seminars to turning wine into vinegar to blind tastings just to name a few. Another part of the event was a food and wine pairing. Food from Charlotte area chefs was paired with North Carolina wine! Here is a slideshow of photos from the event. We appreciate the complimentary tickets for this event! This event was a fantastic way to spend a Sunday afternoon! 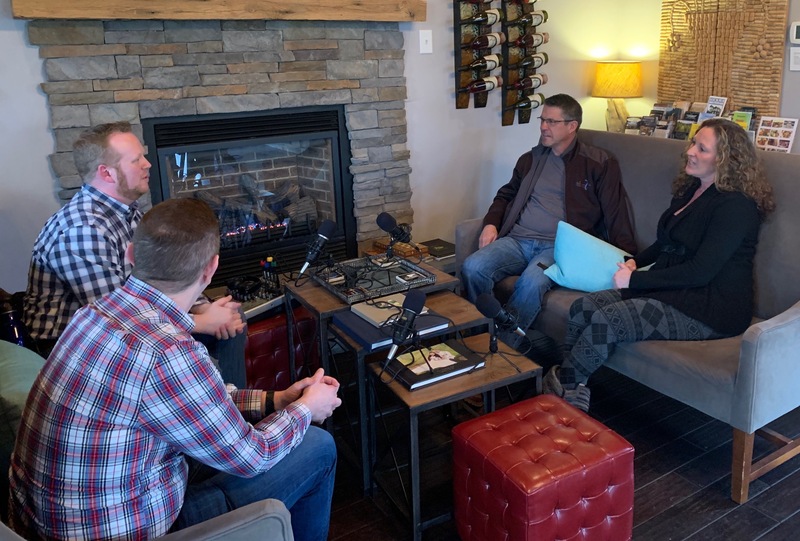 Episode 4 takes us to Silver Fork Winery & Vineyards. We sit with owners Jennifer and Ed talking about their love of wine and how they are making Silver Fork part of their authentic lifestyle. They traded in the corporate life for one that’s at the pace of wine. 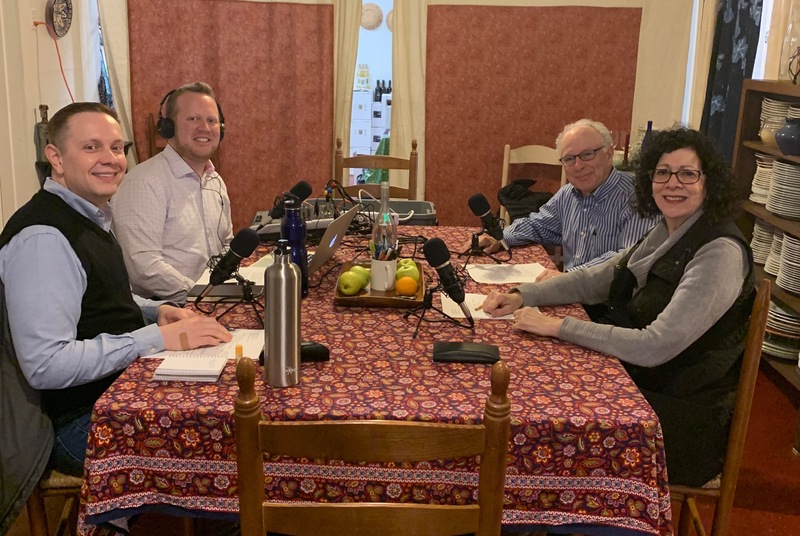 Our third episode of Cork Talk brings us to Piccione Vineyards. 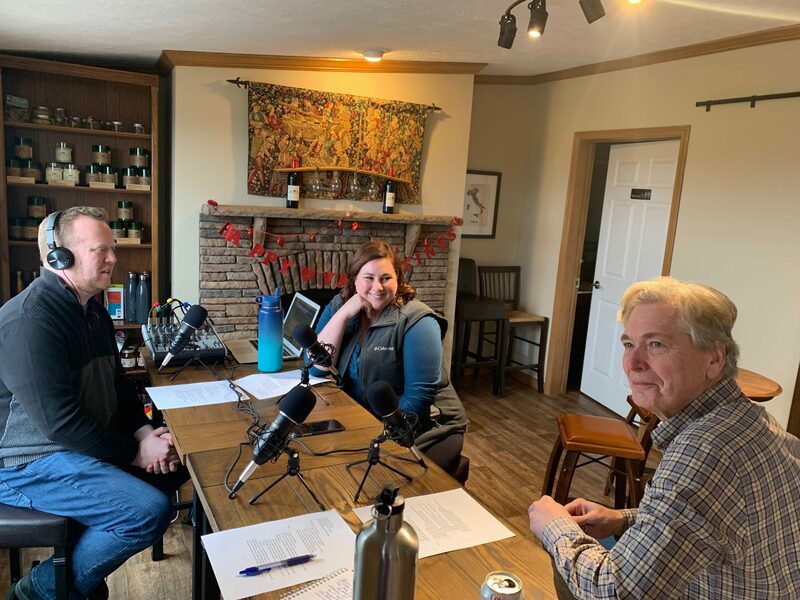 We chat with Bill and Hailey about why Bill decided to start a vineyard here in North Carolina, how he caught the wine bug, and how Hailey has made her way through the industry and joined the Piccione team. 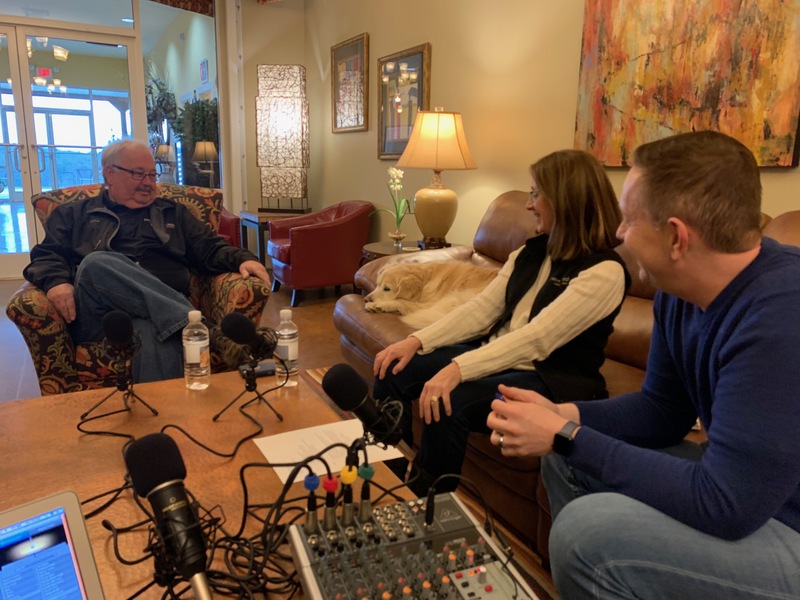 Episode two finds us sitting down with Michael and Amy Helton of Hanover Park Vineyard. Michael and Amy truly are pioneers in the North Carolina wine industry having planted the first vineyard in Yadkin County. We talk about things they’ve learned over the years and how it influences their wines. Join us for our first episode! We sit down with Diana & Chuck from Jones von Drehle Vineyards. Diana and Chuck discuss how they discovered a prime vineyard location in Thurmond, North Carolina. Learn how they work hard to socialize their brand and expand into restaurants and wine stores across the state. 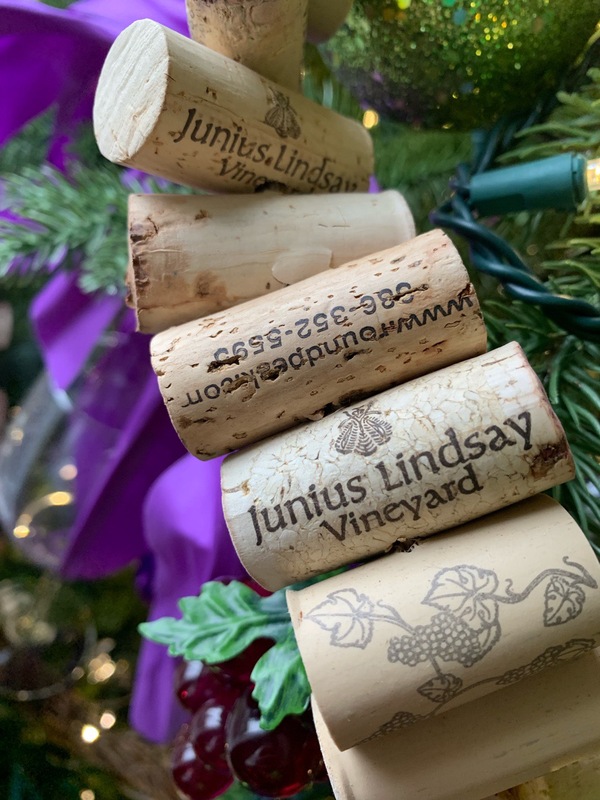 We talk about wine club events, driving more than 1 million miles in the pursuit of wine, and the future holds for Jones von Drehle and North Carolina Wine. 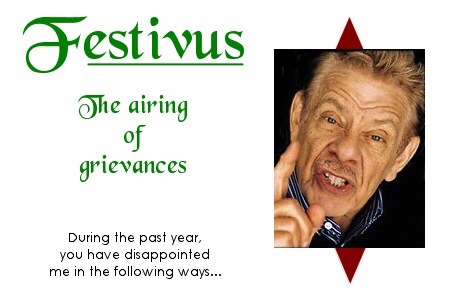 Festivus 2018 – Airing of Wine Grievances! Today, December 23, 2018, is the celebration of Festivus. Created in 1966 by Daniel O’Keefe and popularized during an episode of the hit TV show, Seinfeld, Festivus is celebrated with Feats of Strength and the Airing of Grievances. So, in that spirit, we’re back for the second year to air a few wine grievances. This is our one post a year that’s not entirely positive. Many of these grievances are the same as last year, but there are a few new ones and some updates. So, sit back. Pour a glass and read on! Wines that you can taste but you can’t buy. Why do you allow someone to taste a wine if it’s not for sale to the general public? Of course that’s the wine we want to buy, but we can’t commit to another wine club. Just don’t offer it unless someone does join your wine club. Lack of hashtags in posts on social media about wines, wineries, vineyards. You see we’re big proponents of hashtags as a way to brand. So, all you #NCWine folks out there, USE THE DANG HASHTAG! And don’t put an ‘S’ on it! Be consistent with most other wine regions! The ‘S’ is not necessary! Poor tasting glasses. We’ll admit it. We’re glass snobs. Please no glasses with the “lip” around the rim. These just don’t show wines well. Upgrade the glass and the experience! Untrained tasting room staff. There’s nothing worse than tasting room staff who know nothing about the wines they are pouring. We understand that getting good help can be difficult, but a poor experience affects your brand. Too many wines on the list. We see this all the time. Wines lists with 10, 15 or even 20 wines. We feel this is just too many to be able to focus on quality unless you have a large production staff. So, scale it back. You don’t need a new wine for every season. “Fruited” wines. Why do we need pomegranate, green apple, cranberry, cherry, pineapple and umpteen other fruits added to our perfectly fruity grape wines? Wine grapes produce wines with an abundance of fruit flavors. Let the grapes speak for themselves. Wineries who aren’t forthcoming in where the grapes for their wine are sourced. We like to know what we’re tasting and where it was sourced. If you’re not using local fruit, admit it. Don’t try to hide it. Perfume, cologne, or other powerful scents in the tasting room. Nothing spoils a wine tasting more than someone who’s bathed in perfume or cologne. A majority of the what you taste in a wine is from what you smell. If you can’t smell the wine, it’s likely not going to taste very good. Children in tasting rooms. This is probably our #1 grievance if we had to rank them. Children can’t drink. Don’t bring them with you to a winery. Wining is an adult thing and many of us wish to adult in peace and quiet. Parties of 6 or more in tasting rooms who have not called ahead. This is annoying for tasting room staff and other customers. If you’re in a group, be courteous! Call ahead! People who think cider is more akin to beer. Repeat after us! Cider is NOT brewed! It’s fermented! Thus, it is like wine! Just because you often see is on tap doesn’t mean it’s beer. Wine can be served on tap too. We’d like to see more of that by the way! Farm to fork restaurants who don’t have local wine on their lists. This is probably #2 on our grievance list right after the kids at wineries. Don’t call yourself a farm to fork locavore restaurant if you don’t have local wine on this list. There’s just no excuse! So, that’s our list for this year. And keeping with this theme, leave us your comments of what’s your grievances are. Just avoid personal attacks. Cheers and Happy Festivus for the rest of us! Mulled Wine and Cider are always favorites in the cooler months of the year. We often serve Mulled Wine during the holidays or on days with wintry weather. We have gone through several iterations of recipes. Most have been made just using red wine as a base with bit of bourbon. A year or so ago, we found a recipe that incorporated wine, cider, bourbon and tawny port. We have played with it a bit and would like to share it with you. If you are looking for a warm mulled drink that is just slightly sweet, give this recipe a try. If you would like a sweeter version, you could always add honey or brown sugar to taste. Start with spices. You will need cardamom, whole cloves, star anise, whole black peppercorns, whole allspice, cinnamon sticks, and a whole nutmeg. Crack the cardamom pods. Toast the cracked cardamom pods, star anise, cloves, peppercorns, and allspice berries in a skillet for just a few minutes. Two – three minutes is all you need. Stir constantly to prevent burning. The smell will be divine! Next, make your cheesecloth bundle with sliced ginger, orange peel, and your toasted spices. Secure with butcher’s twine. In your slow cooker, pour in your liquid ingredients including the juice of half an orange. Stir. Add your cheesecloth bundle, cinnamon sticks, and sprig of rosemary. Heat on low for two hours. 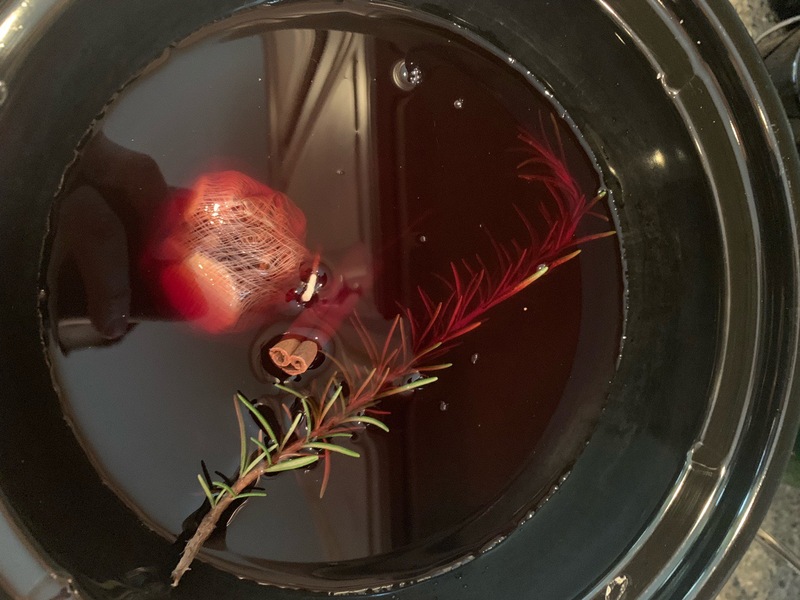 Then remove cheesecloth and sprig of rosemary. Grate fresh nutmeg. Stir. Heat on low another two hours. Remove cinnamon sticks and turn setting to warm. Serve warm. Heat small non-stick skillet over medium heat. Once the skillet is hot, add Star Anise, Cardamon, Cloves, Allspice, and Black Peppercorns. Toast for 2-3 minutes stirring constantly to prevent burning. Place toasted spices in cheesecloth along with Grated Orange Peel and Ginger. Pour wine, cider, port, and bourbon into slow cooker. Add cheesecloth bundle, rosemary sprig, and cinnamon sticks. Set slow cooker to low. Remove rosemary and cheesecloth bundle. Grate a dash or two of fresh nutmeg. Continue to heat on low for another hour or two. 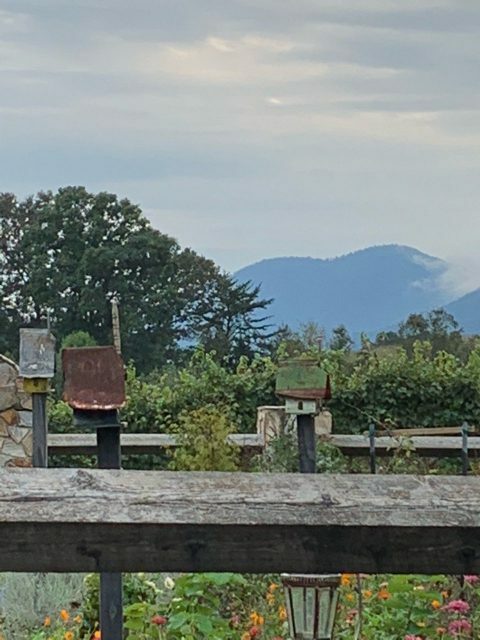 We had the opportunity to close out North Carolina Wine and Grape Month 2018 with some of our fellow wine bloggers on a tour of three wineries/vineyards in the Tryon Foothills of Polk County. Our transportation was graciously provided by Ryan and Terri Watts of the Van In Black. The Van in Black is THE way to tour wine country. We highly recommend Ryan. He is the ultimate professional and takes great care of his guests. Now on the the main event, wine tasting with fellow bloggers. Rather than a normal wordy blog, we’re going to let the photos do more of the talking. Some photos were provided by Ryan Watts. Ryan also runs Ryan Watts Photography. We appreciate the use of these photos. Our first stop was Overmountain Vineyards where we had the pleasure of a tasting and tour with Sofia Lilly. Sofia is the one of the winemakers at Overmountain along with her father Frank. Frank stopped by to visit with us as well. Sofia also manages the vineyard and the social media presence for Overmountain. In addition to delicious wine, we also had delicious food from Olive Catering Company. 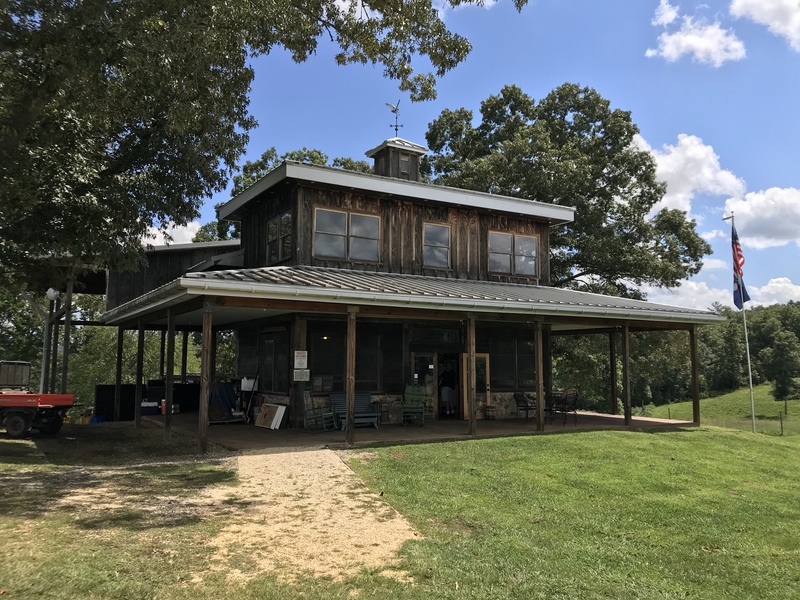 Our next stop took us to Mountain Brook Vineyards for a tasting with owners Jonathan and Vickie Redgrave and winemaker Liz Pickett. Mountain Brook has just completed extensive expansions to its grounds. We ended the day with Sunday Funday at Parker-Binns Vineyard. Kelly Binns was holding down the fort as owners, Bob Binns and Karen Parker-Binns, were on a well-deserved vacation. In addition to the great wines, we enjoyed wood-fired pizza. And since we were in a for hire vehicle with a designated driver, we did enjoy some Parker-Binns Rosé on the way back home. Thanks to the Wine Mouths, Winery Escapades, and HD Carolina for joining us on this tour. We look forward to our next adventure with our fellow bloggers! To start off our NC Wine Month celebrations, we decided to make a trip out to vineyards in far western North Carolina. How far west? Well, at one of the vineyards, you can see Tennessee and Georgia as well as North Carolina. That’s right, we made a trip out to the wineries out in Murphy, Andrews, and a surprise visit to Robbinsville. From our home base in Mooresville, our first stop at Nottley River Vineyards in Murphy, NC was about 4 hours away. 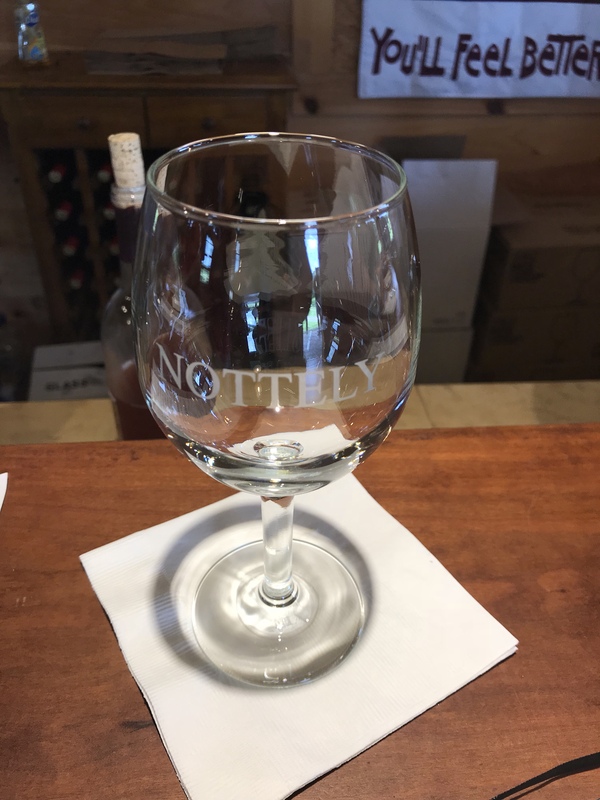 We took off early, made a quick stop for lunch, and made it to Nottley River Vineyards not too long after they opened. There was already a good crowd there when we drove in, so we made our way to the tasting bar. After the formal tasting, Steve took us out to the crush pad and gave us a sneak peek of the 2016 releases (which was a stellar year). Most of these will be ready in Spring 2019, so we’ll be making a return visit for sure. Next up was FernCrest Winery in Andrews, NC. This was our first visit to FernCrest and we had a great time. Co-owner Jan Olson guided us through our tasting. They have a small vineyard of their own, but also buy fruit from across the state and elsewhere. One interesting fact is that each of their wines are named after a different fern, and each label has a drawing of that fern. The white wines we tasted had a great acidity and will be perfect with some early fall foods. Calaboose Cellars is just a few blocks away from FernCrest. This winery is officially the state’s smallest self-contained winery, measuring in at about 300 square feet for the whole operation. They focus on producing small batch wines that are very well crafted and fruit forward. Judy conducted our tasting and we were happy to see all the new wines on the list. After we finished up, we decided to head back to our hotel. On the way, we made a last minute decision to head to new-to-us meadery, Wehrloom Honey in Robbinsville, NC. This unexpected stop turned out to be a great visit. Wehrloom is an active farm with hundreds of beehives. Honey from these hives is used to make their meads along with the other honey products they offer in their shop. We went through a quick tasting at their tasting bar and went on a walking tour of the farm. If you stop by, be sure to take a quick hike up the hill and see massive land tortoise that’s in with the goats and chickens. He’s a lively thing. Read on for tasting notes of the wines at each of the locations we visited. 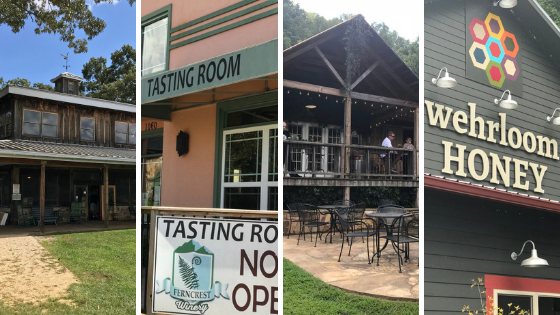 If you find yourself out in far Western North Carolina, we highly recommend a visit to each of these wineries. 2014 Seyval Blanc – This wine went through partial malolactic fermentation. It had a mellow nose of stone fruits. The palate was rich in minerals with a flinty finish. 2015 Chardonnay – This Chardonnay is Chablis style meaning all stainless steel and no oak. Green apple, fresh acids and a nice overall fruit profile were present on this wine. Dry Rose – A blend of Chambourcin, Cabernet Franc, and Cabernet Sauvignon. Watermelon and red fruits came through on the nose. Nice acids, mild strawberry and a rounder profile were present on the palate. 2015 War Woman Red – This blend of both Cabernets had an herbaceous nose. The flavors were light with strong acids and slightly twiggy tannins. 2015 Chardonell – This off-dry wine was filled with big yellow apples, nice acids and a mildly sweet profile. 2015 Riesling – This semi-sweet Riesling had a floral nose mixed with apricots and wet stones. Overall fruit forward and well rounded. 2016 Oaked Chardonnel – Aged in Hungarian oak, this wine had a very nice oak presence. Grapey acids came through on the palate with excellent fruit character. 2016 Chardonnay – Aged in Hungarian and American oak, toasty vanilla clearly came through on the aroma. No malolactic fermentation means this wine has great green apple notes with crisp acids. 2016 Cabernet Franc – This wine had a classic cabernet franc nose with light pepper gracing the aroma. Green and White peper came through on the finish and were supported by a bright cherry profile. 2017 Seyval Blanc – This bubbly wine was nice and effervescent. The nose was slightly slightly foxy with wile grape flavors balanced by a nice acidity. Royal White (Vidal Blanc) – This wine had a nice floral nose with subtle white fruits. The flavors were nice and acidic with an overall pleasing profile. Southern Lady White (Chardonnel) – The nose was of lemon cream. The flavors were bright with citrus lemon and very zesty. Mountain Holly Red (Bordeaux Blend) – The nose was of tomato jam and figs. Red fruits came through on the palate with gentle tannins. Mountainwood Red (Cynthiana) – The color on this wine was incredibly dark. Baking spices and dark fruits came through on the nose. Big acids came through on the palate with a smooth overall profile. Fiddlehead Red – This slightly sweet red blend had a great fruit forward profile. Black Lady – This dessert wine of blackberry and blueberry was nicely balanced. It was only mildly sweet with a great fruity profile. 2017 Seyval Blanc – Pleasing apricot and mild fruits came through on this mildly sweet white wine. 2017 Norton – This was dark and inky. Having gone through malolactic fermentation, it imparted a jammy flavor with a slightly acidic profile. Not yet released. 2017 Chambourcin – This wine had a classic Chambourcin profile with light baking spices. Being off-dry, it highlighted the red fruit flavors with an overall smooth profile. Sparkling Niagara – The grapey nose was unmistakably Niagara grapes. The flavors were not too sweet with a nice fruity balance. 2017 Catawba – Fresh acids and a great grapey profile made this wine very easy to drink. Revinoors Red – This wine made from the Sunbelt grape is brightly colored with an overall foxy profile. Dry County Dry – This mead was very herbaceous with a nice and mellow overall profile. Home Sweet Home – This mead was made from sourwood honey. It had a nice nose, slightly sour, with a fantastic honey profile. Black “Bear”ry – This mildly fruity mead was less sweet than the sourwood, but still had a great herbaceous profile . Pretty in Peach – With a name that implies sweetness, this mead was surprisingly tart with clean peach flavors and a nice overall profile.